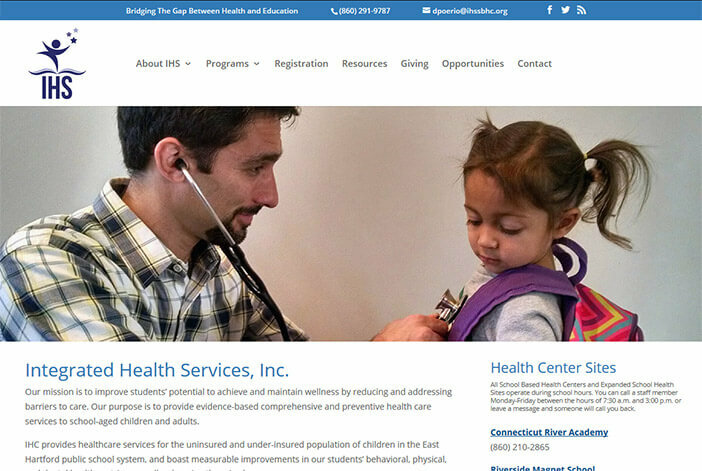 Bridging the gap between health and education, Integrated Health Services aims to improve students’ potential to achieve and maintain wellness by reducing and addressing barriers to care. 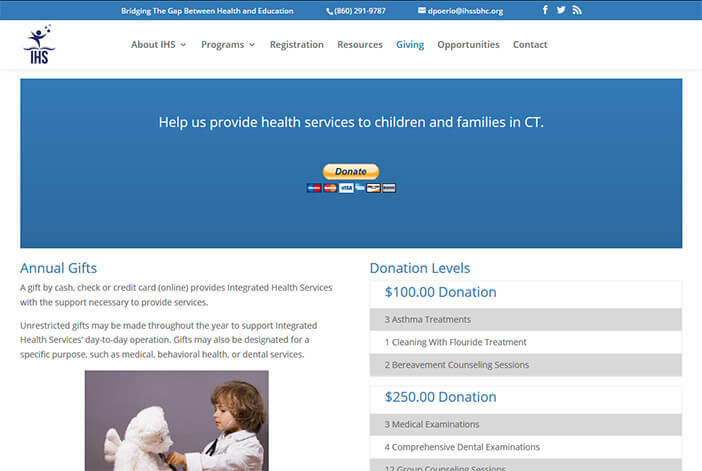 This wonderful organization serves the East Hartford, Connecticut school system and we are proud to help them achieve their goals online. 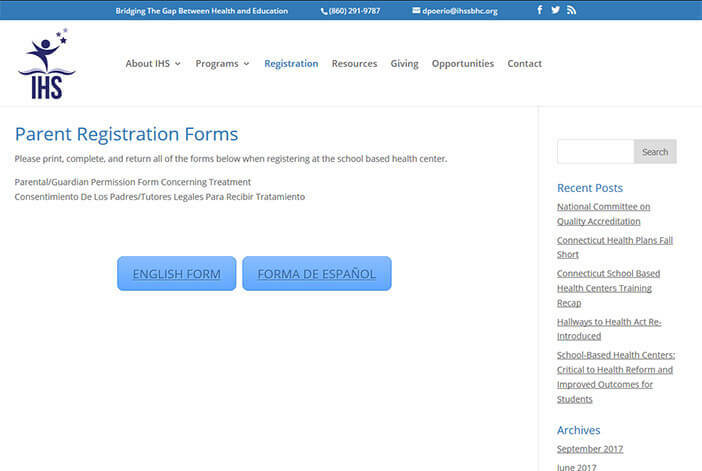 3PRIME created a new web presence that allows visitors to easily get the information they need about services and programs, download registration forms, and donate directly to Integrated Health Services. Security is always a concern, therefore we encrypted this new website using SSL to secure data on the site, particularly with the contact form. A mobile-friendly, responsive website was developed with search engine optimization in mind, using up-to-date coding standards. 3PRIME created and setup a Google Analytics account for Integrated Health Services. Tracking and analyzing website data is critical for improving a website, increasing organic rankings, and understanding visitors. 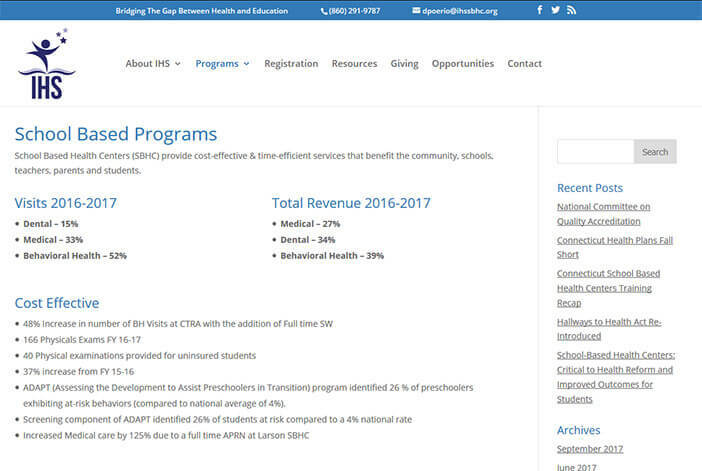 3PRIME is hosting the Integrated Health Services website. 3PRIME knows how important it is to have someone you can trust and turn to for advice and troubleshooting when necessary. Hosting the site allows 3PRIME and IHS to continue working together and collaborate on any issues, changes or problems that arise. The site also uses SSL, securing any data transmitted by forms.